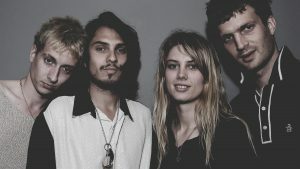 Named after a short novel by Angela Carter, their even shorter lifespan has seen Wolf Alice grow into a dynamic live band as well as songwriters with a vision creating songs that sound simple but aren’t so easy to write. Catchy riffs and odd little turnarounds, an inventive guitarist in Joff Oddie, punchy drums and bass from Theo Ellis and Joel Amey and cool lead singer/guitarist Ellie Rowsell make them an appealing, melodic Indie attraction. There’s something unfussy about them, something serious about their attention to their songwriting and musicianship as if their cool demeanour is a result of their skills rather than due to the lack of them. They’re the kind of band I like without trying, the kind of band that are mostly concerned with their own development, they realize that outside of their musical chemistry there is nothing that helps them be better, only each other and a dedication executed in short blasts of Indie bliss. Their Mercury Music Prize nominated debut album My Love Is Cool was released in 2015 on Dirty Hit Records reaching No.2 in the UK charts.